Another noiseless automatic washing machine from the Haier brand with a capacity of 20 kilograms. This Haier HWM200-1678 machine consists of 12 programs including white, normal, casual etc. You can easily wash jeans, cotton, synthetics, and wool. This machine has a function of a quick wash. The company is providing 12 months warranty of motor. The rated power of 700 wattages is required for the washing and 500 watts of electricity is needed for the spinning. The LED display of this fully automatic shows the remaining time and also shows the different error codes. Click here to check the causes and solution of those error codes. It is an energy efficient machine. The spin speed is 1300 (RPM) and weight is 79 Kg. Machine Parts Top lid, Outer tub cover, Inner tub, Detergent box, Pulsator, Control panel seat, Water absorption washer, Cabinet, Cold water inlet valve, Screws, Hook, Power cord, Drain hose joint, Back cover, Fixed foot, Adjustable foot. Disclaimer: We tried our best but we cannot guarantee that the Specs/Price on this page is 100% correct (Human error is possible). For buying and correct info. always visit the nearest local shop/dealer. Power Button How powering on, Press the “Power Button” for 3 seconds. During power-on mode, Push it 3 seconds to power off the machine. Start/Pause Button Under power-on mode, Pree it to start the machine & push it to pause the machine. LED It displays Time Remaining & in case of any malfunction, it shows error codes. Favorites The machine will set to the favorite program. Wash, rinse, spin automatically last time. Soil Level Button you may use this button function to best tune your wash cycle base to your laundry. Spin Speed You can use this button to change in the spin speed. Wash options Pre Soak – The pre-soak indicator will light when pre-soak is chosen., Fabric Softener – This function will make sure that the selected wash cycle is optimized for a rinse additive. during the final rinse, cloth softener is going to be released into the wash load as the dispenser is flushed the water. Extra Rinse – You can use this function to On/Off extra rinse function. Water Level Adjusting the ‘Water Level’ button will result in shorter or longer wash times. Cycle Signal You can use this button for adjusting the volume of a control panel beeps. Delay Wash This function is used to delayed start of the washer. White This function is used heavily soiled white fabrics. Normal This function is used for normally soiled cotton and mixed fabric loads. Casual You can use this function to wash light soiled dark fabrics, such as cotton. Heavy Duty Use this cycle to wash a full load, durable and best for kids clothes, towels, etc. Eco Wash To wash normally soiled mixed fabric and to save electricity with cooler wash water. Bulky You have to use this function to wash bulky items such as sleeping bags, blankets and comforters. 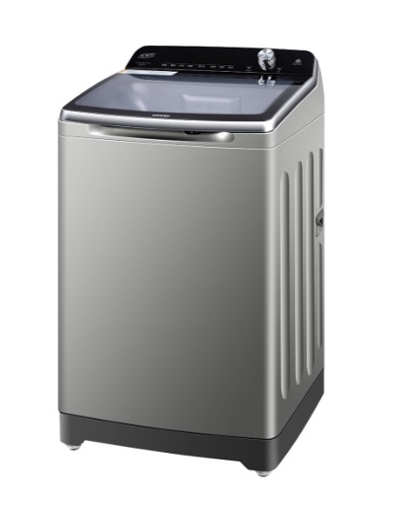 Quick Wash This function is used to wash lightly soiled clothes, small loads that are needed in urgent. E1 The machine does not drain or drain slowly. Blockage in the drain hose. Remove the blockage. Push the Start/Pause Button. E2 The machine is not running. The top lid is not closed. Now close the top lid for solving the issue. E3 The machine does not spin. The laundry is placed unevenly in the machine Redistribute the load evenly. E4 Water issue. Water supply is interrupted/tap closes/low water pressure/inlet valve blocked/drain hose set too low. Clean the water inlet valve/Drain hose should be between 800mm-1200mm. FC The failure of communication between display panel board and motor driver. — Please contact Haier customer care. E9 Communication failure between show board and power board. — Please contact customer care. F2 Overflow error. — Please contact customer care. E8 Door lock broken. — Please contact customer care. FA The washing machine water level sensor has failed. — Please contact customer care.